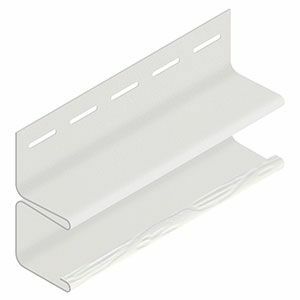 ALT: Used at the top of the wall and on the bottom of the fascia board to insert soffit. F-Trim derived from the pieces shape resembling the letter F.
Concealed when installed to enhance appearance. Prevents heat loss by eliminating gap at the bottom of the door. Long-lasting and lightweight with a total weight of 1.2 lbs. Long-lasting and stylish, f-channel siding is a great fit. Comes in a pack of 40 pieces. ABTCO vinyl siding is manufactured to the highest quality standards and designed to last for decades. ABTCO vinyl siding is warrantied to be free from manufacturing defects that result in peeling, flaking, rusting, blistering or rotting during the lifetime of the original purchaser, subject to the terms and conditions set forth in detail within the ABTCO siding warranty. With a deep woodgrain, and impressive performance figures, Cedar Creek vinyl siding is designed to offer affordable protection for your home. Harbor Ridge Plus siding's deep lap profile and stunning dark colours provides enhanced beauty and increased installation rigidity. F-Channel Antique Ivory (40/BOX) ALT: Used at the top of the wall and on the bottom of the fascia board to insert soffit. F-Trim derived from the pieces shape resembling the letter F.